In medium bowl, beat eggs, salt and pepper with wire whisk. Stir in ham and bell peppers. In 12-inch nonstick skillet, melt 1 tablespoon of the butter over medium-low heat. Add egg mixture. Cook 1 minute, gently lifting edges occasionally with spatula to allow uncooked egg mixture to flow to bottom of skillet. (Eggs will not be cooked at this point.) Continue to cook, lifting cooked portions until eggs are thickened but still moist. Remove egg mixture from skillet; keep warm. Wipe skillet clean. Spread 1 to 2 tablespoons remaining butter on 1 side of each tortilla. Place 1 tortilla in skillet, buttered side down. Top half of tortilla with one-fourth of egg mixture to within 1 inch of edge. Sprinkle one-fourth of cheese over egg mixture. Top with 1 tablespoon of green onions; fold other half of tortilla over filling. Increase heat to medium. 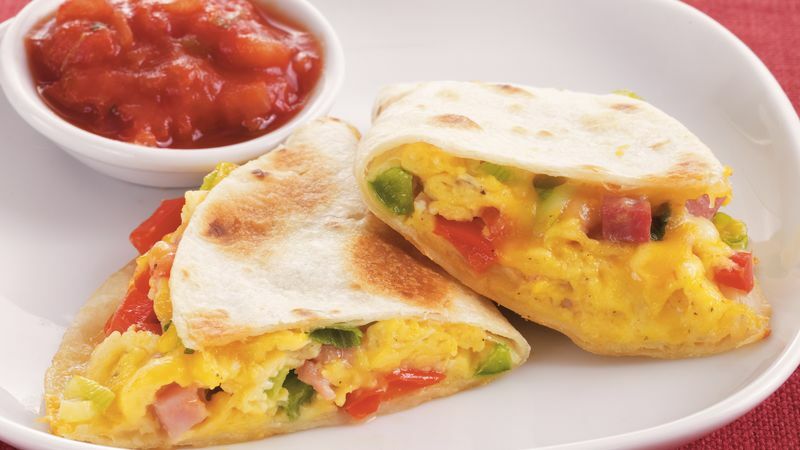 Cook quesadilla 2 to 4 minutes, turning once, or until golden brown and cheese is melted. Repeat with remaining tortillas, egg mixture, cheese and onions. Serve warm with salsa.